At the height of summer Grand Circuit and fair racing, the subject of racetrack attendance and handle seems less concerning than at other times of year. But Ryan Clements isn’t content with the status quo, not even as grandstands fill during the summer. 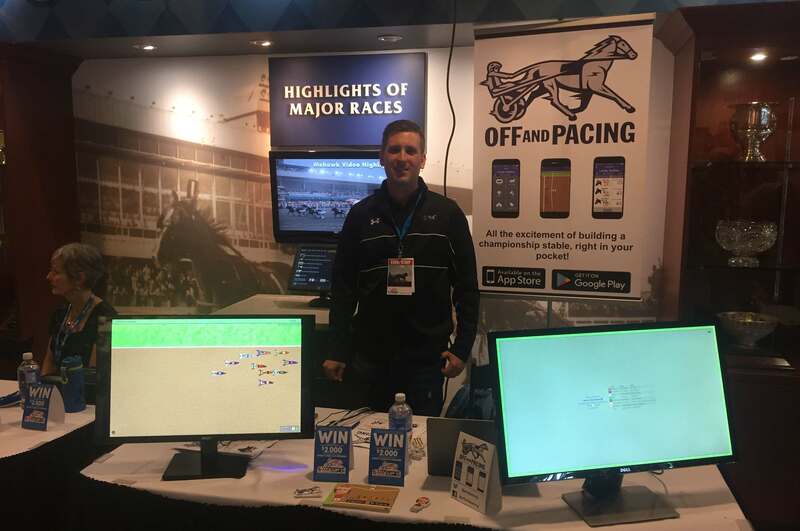 The Uxbridge, Ont., video game developer is rapidly gaining industry prominence for his sport-specific game, Off and Pacing. Clements, who is based out of his office at Prince Lee Acres, an active Standardbred racing and breeding operation, said that it’s his objective to use the mobile phone game to help bring harness racing closer to the heights witnessed during the career of the “Pacing Machine,” Cam Fella, who was co-owned by Ryan’s grandfather, Norm. A user-friendly interface makes navigating the app easy and fun. Introduced in the Google Android and Apple app stores on April 27 and May 3, respectively, Off and Pacing debuted at the beta test level last winter. It attracted test players from social media to advise on ways to optimize the gaming experience, which incorporated building and managing a racing stable. 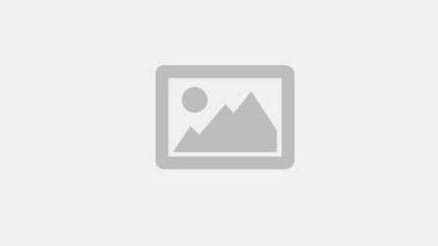 A breeding stable component has since been added. Off and Pacing is an informal educational tool, allowing gamers to learn about the varied aspects of running a real racing stable. 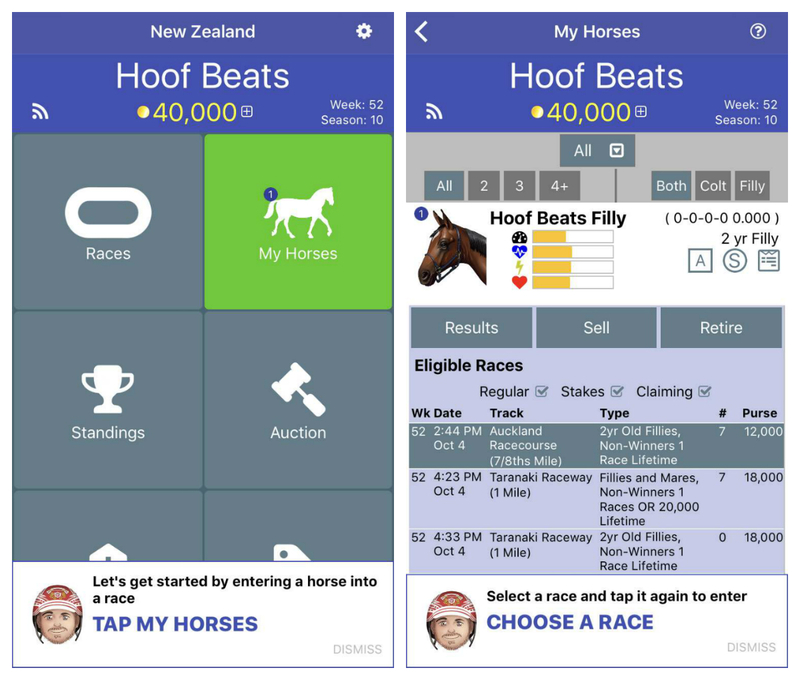 The game is free to download in both app stores, and “coins” can be purchased to buy horses, pay staking and stud fees, and make other financial transactions within the virtual harness racing community. Coin sales are the developer’s sole source of game revenue, but coins don’t equal automatic success in Off and Pacing, noted Clements. “Out of our top 10 [players], it seems that about half of them are people that purchased coins, and the other half are just good players,” he said. As in actual harness racing, skillful stable management can put Off and Pacing players in position to win. 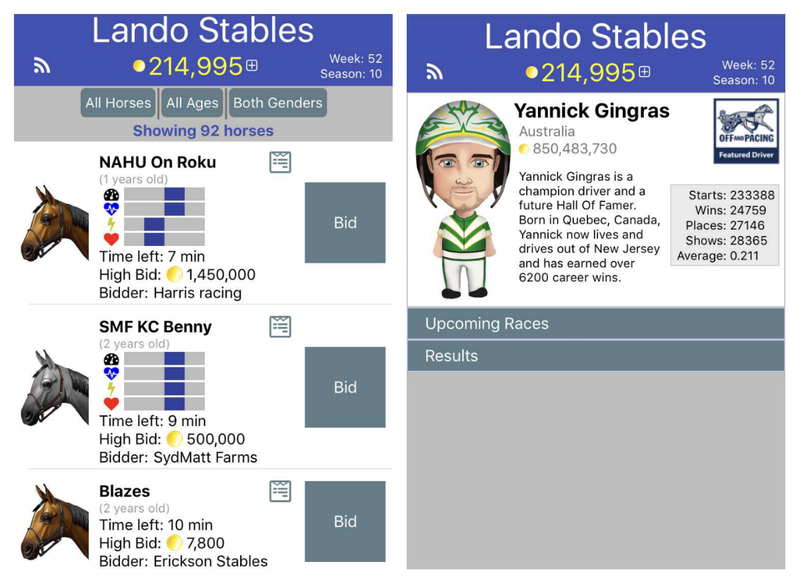 GAME ON: These sample pages from the Off and Pacing app demonstrate the layers of information available to any player. Above left: A menu page lets the player choose which aspect of racing he or she wants to act on. 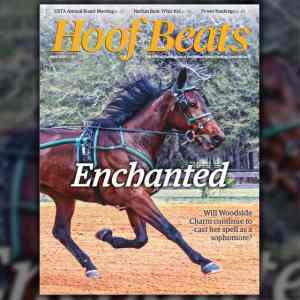 Above right: This page displays the typical information a player would see after entering a fantasy horse – in this case Hoof Beats Filly – in a race. Two months following its launch on Apple and Android platforms, Off and Pacing has outperformed even the most optimistic projections by The Farm Ventures, his game’s parent company. “Every step of the way, it’s been growing faster than we ever expected,” Clements said. “That was kind of nerve-wracking at times, because during the beta-testing, at that stage when we went from about 200 people to 1,000, it basically took the servers right down! So I was working all night in Hong Kong, trying to figure it out. Above left: This page, created for a player going by the name of Lando Stables, shows a list of horses up for bidding in a fantasy auction. 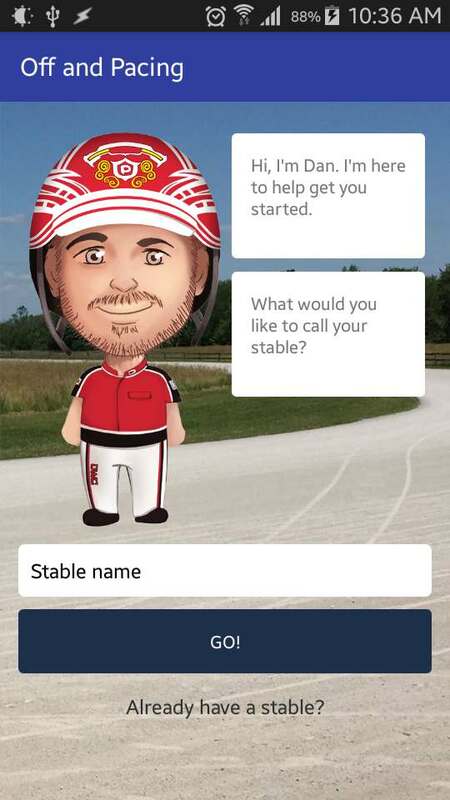 Above right: Several successful real-life drivers, including Yannick Gingras, have permitted the creators of Off and Pacing to use their likeness for catch-drivers in the game, allowing inexperienced players to connect to some of the top trainers and drivers at real tracks. The game hit No. 4 on the Canadian racing game downloads chart shortly after its commercial debut. This category includes games based on all kinds of racing, making Off and Pacing’s rapid rise to prominence an unexpected thrill for the team behind it. Clements would like to see partnerships between Off and Pacing and real-life racetracks to continue raising the profile of racing. There is a further industry-promotional element of the game: Clements said it is already helping connect inexperienced players to some of the top trainers and drivers at real tracks. Numerous successful horsemen, such as Yannick Gingras, Aaron Merriman, and Corey Callahan, have permitted their likenesses to be available for catch-drives in the game. Off and Pacing has become an online meeting place for people with wildly different levels of experience in harness racing, and the connections made create a feeling of personal involvement, one which may expand to include fractional horse ownership, racetrack attendance, or pursuit of a career as a driver, trainer, or caretaker. It’s not a direct or guaranteed escalation from game-player to bona fide racing participant, yet Clements noted that players’ dedication makes that leap more likely. Rather than drawing attention or dollars away from real racing, Off and Pacing acts more as a notification system in players’ pockets, reminding them of the sport every time they check on their virtual stables. Next: Life After Racing: Who’s the Boss?